The Urban Home Republic store in Chadstone features furniture, home ware and décor items for modern homes. Manned by a friendly and well-informed staff, shopping in Urban Home Republic Chadstone is different to what you would come to expect from your usual store. Urban Home Republic is a line of Australia's renowned speciality retailer Adairs, which launched it in 2006. Home furnishings from Urban Home Republic line are usually with or ahead of the trends. The Urban Home Republic brand offers a range of home furnishing products such as cushions, towels, bedding, linens, and furniture to beautify homes. It also stocks scented candles, spa diffusers, indoor plants, weave baskets, wire lanterns, and timber clocks, to name a few. The Urban Home Republic collection features various inspiring ideas to liven up Australian homes. While many of its creations draw influences from global trends from time to time, it stays true to its Australian roots for the most part. Effortless and relaxed style in contemporary modern designs seems to be the general trend with the Urban Home Republic line of lifestyle products. 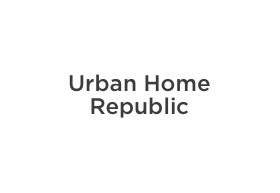 Urban Home Republic stocks items in well-coordinated colour shades that sit well with many décor themes while staying in line with the latest trends in the industry. The colour palette is diverse; includes mellow shades like charcoals, pastels, sorbets and cool tones, which easily combine with the existing décor, and vibrant hues in edgy patterns that catch the eye alike. Textures come in many styles- bulky knits, smooth metallics, fine linens, delicate furs and more. Quirky finds are not uncommon to the brand; reversible bedding sets,, vintage linen napery, metallic side tables - are just some examples of unique items that you would find in an Urban Home Republic store.